Traversing the significant vegetable garden and piles of stacked firewood (the Coutures are quite self-sufficient, growing most of their own food in a vast hillside vegetable garden, and chopping and storing wood to warm their home in winter), we finally arrived at “the trailer.” Actually, it was more permanent and comfortable than maybe that sounds. The trailer sat beneath a shed-like, post-and-beam structure with a corrugated metal roof and awnings poised for instant shade and solar panels. Once inside, it was apparent this studio-on-wheels had been painstakingly and lovingly remodeled with wood-framed windows, beautiful cork flooring, a wood stove, and exceptional insulation. Her work and artist implements hung on the walls. Renee explained to me the need for the insulation and the wood stove: It’s blisteringly hot in summer, bitterly cold in winter. But she makes the trek up the mountain to her workspace, year ‘round, holding her earthenware coffee cup brimming black, maybe stopping to pick vegetables or water the garden, her dogs following her. Renee moved to Oregon from Phoenix, Arizona, though she is originally from the Midwest (Wisconsin and Iowa). She made the move to Oregon for love—following “the boy” she later married. They had met as Peace Corps volunteers in Bolivia—which I learned later entailed a whole host of other wild adventures, but that’s for another story. Renee, surveying the land around her and gazing off to the forested mountains across the valley, commented, “Growing up, I always thought I would live in a large city.” While she loves visiting urban areas, she said, she “couldn’t imagine living in one” primarily because she doesn’t like traffic or finding a place to park. When we walked back down the hill to our waiting dinner, Renee’s husband was pouring us chilled Chardonnay in sparkling crystal goblets, treasures handed down from Renee’s grandmother that seemed wildly elegant in the these surroundings. A creek next to our outdoor dining table gurgled away adding ambiance to our dinner (the couple’s source of water, they told me, comes from the creek). The dogs, finally tired of barking, curled up on the deck and slept. Renee and her husband told me about his work in the forestry service, their long walks on the area’s isolated logging roads, discovering the land and what it can (and can’t) provide for them, and how Renee gathers inspiration and ideas for her work from the forest and wilderness environment around her. We cleared up the dinner things, washed the dishes and talked about the “big city.” Talk of Portland (which for the purposes of our discussion was referred to as “the big city”) led to stories about First Thursday trips and comparisons between city and country, where Renee had nowhere to wear the fur coat, a vintage heirloom that had been her grandmother’s, she lamented. In Peel, there was no reason to wear it. The experience living, observing and surviving here comes across in the work Renee makes. From the cross-section log-rubbings done on her long, logging road walks (the finished works hang on her trailer walls) to the wax-and-paint coated ribbons hung to dry in the hot summer sun to a piece such as Labor Day’s Labor 2010 (“I planted seeds in my garden, covering them with the paper mulch. Soon I will nourish my body with the food that grows through the drawings…”), Renee’s work communicates the relationship she has with this part of Oregon and her life here. 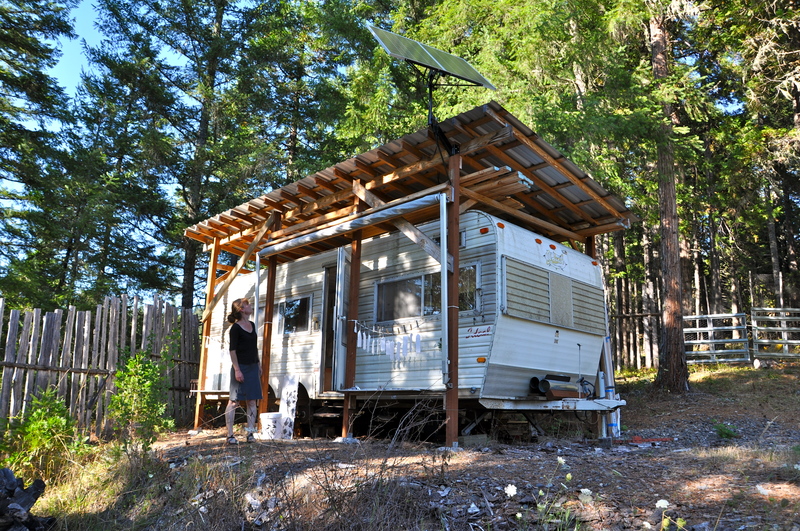 I got the feeling she was incredibly happy living in this remote area of Oregon, cooking her garden-grown vegetables in her outdoor kitchen, exploring the logging roads and forests for inspiration, and making the walk to her studio. As Renee says, “I’m very much tied to my property; my life ebbs and flows with the seasons.” And while Peel might not be a place where Renee finds she wears her fur coat very often, it’s clearly the place she finds her muse. 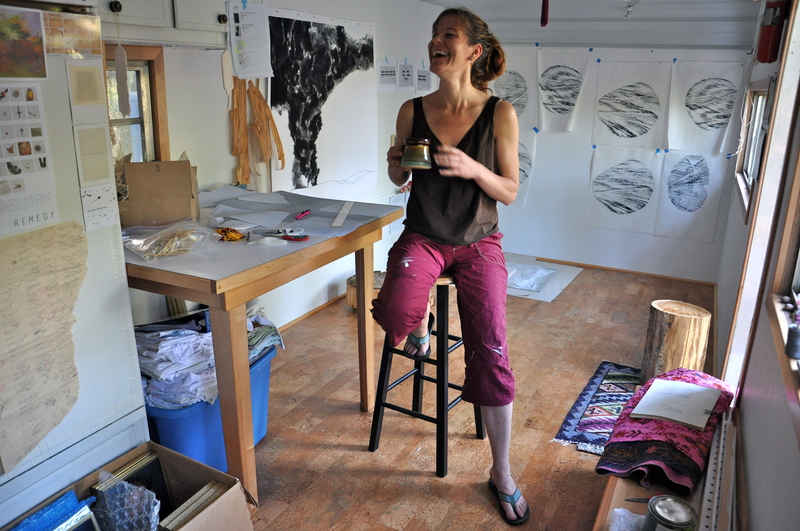 Read more about Renee Couture and other Oregon artists in Connective Conversations, due out October 2015.